See what we at Gluten-Free Heaven HQ thought of a selection of the latest cereals to hit the aisles. 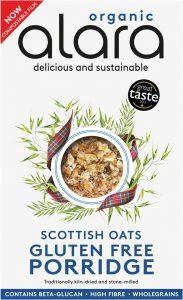 For a traditional no-nonsense porridge, we thought these oats from Alara fit the bill perfectly. With a little bit of hot milk they stir-up forgotten memories of cold winter mornings as a child being comforted and warmed by a simple bowl of delicious and hearty porridge. 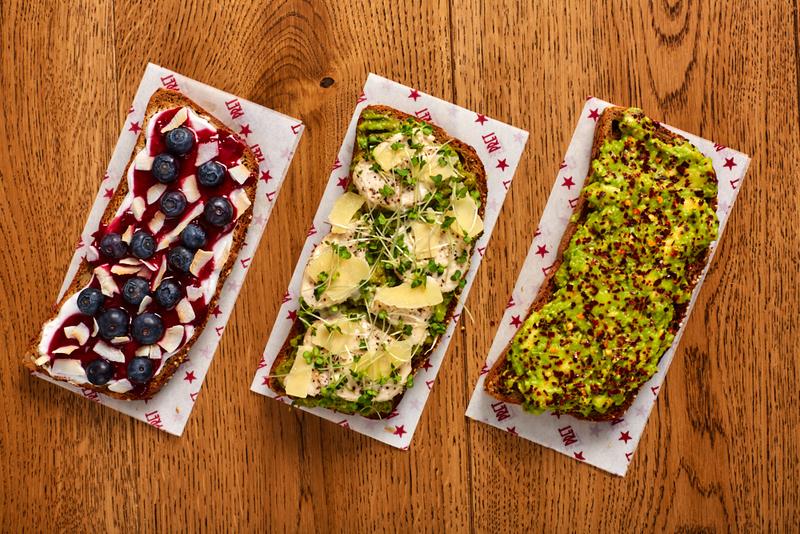 Some memories we have of food are best left in the past, but we think you’ll be happy to have reignited this old one. 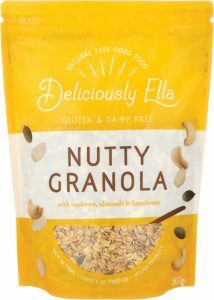 This was a firm hit with our travelling party, the new-found crunchiness of Deliciously Ella’s granolas really adding to the already well established great taste. The maple syrup comes through a treat, as does the addition of the pumpkin seeds, sunflower seeds, cashews, almonds and hazelnuts. As granolas go, this is pretty good, if you can forgive the price. These little breakfast puffs work well for the youngsters, perhaps not so well for those looking for huge amounts of exploding flavour and a crunchy texture for their morning feast. We made ‘Rice Krispie’ cakes with what we had left (you do get a lot for your dollar) and took them on one of our days out – perfect for an on-the-go snack, and great as a bribe for a little bit of peace and quiet! 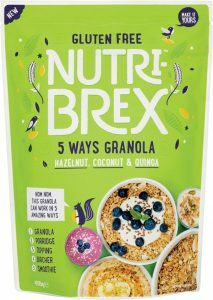 Nutri-Brex are proving to be a force in the breakfast market place of late, and we can see why. This hazelnut, coconut and quinoa granola is tasty, crunchy and works well with milk or a dollop of yoghurt. It’s not as sweet as some other brands which certainly appeals and the hints of coconut come through nicely. Low in sugar and high in fibre, it makes a great start to the day. 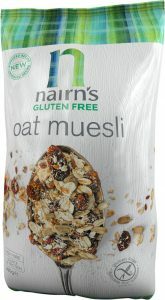 This delicious muesli is rich with fruit, soft and very, very tasty. In fact, such was its popularity it was hidden on day two of the holiday so that just the adults could have the pleasure. Mean? Sure. Fair? No. The right Decision? Absolutely! The sugar content is reasonably high due to the abundance of fruit, so if this is a concern simply remove some and save for later. Our favourite of the week. Crispy, crunchy and full of flavour, this cereal is wonderful in a bowl of milk and ticks the boxes as far as a day-to-day go-to staple. It is sweet, so no extra added sugar is necessary, but what gives this offering from Nature’s Path a ‘big-up’ is the texture. 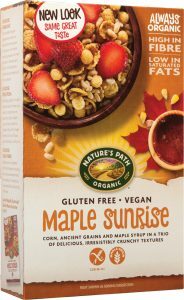 Made with flakes, puffs and crispies, it has a crunch lost in other glutenfree cereals. A really good addition to the cupboard. 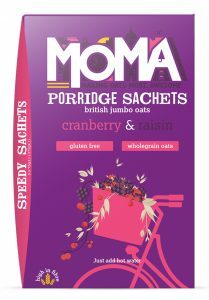 Quick, easy and tasty, Moma have given us 5 sachets of porridge oats that you simply open and empty into a mug and add hot water. They are sweet and chewy enough that you get the texture you are looking for, but not too much that you certainly aren’t. With just the one packet between us, it wasn’t the largest of surveys, but 5 out of 5 saying they enjoyed it is a pretty good return! We had this with milk, but reckon it would be even more delicious with yoghurt. 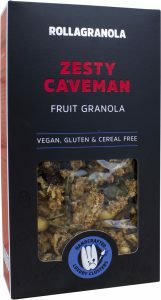 The huge chunks of granola were ‘so good’. The apple and cherry flavour is very prominent, but not overpowering and there is a subtle hint of ginger. There are textures going on everywhere and the the chewy fruit adds to the experience. Really satisfying and every bite a delight! 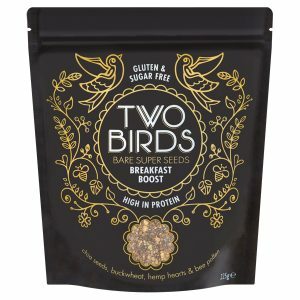 If you fancy adding even more flavour and texture to your breakfast, why not try sprinkling over a few Bare Super Seeds by Two Birds. They simply contain added bee pollen (one of nature’s most nutrient dense superfoods) for sweetness without sugar and cinnamon for flavour. This blend adds texture and nourishment to porridge and is delicious sprinkled on a green smoothie bowl.